First-year Marjorie Antohi powerfully swings during her match. 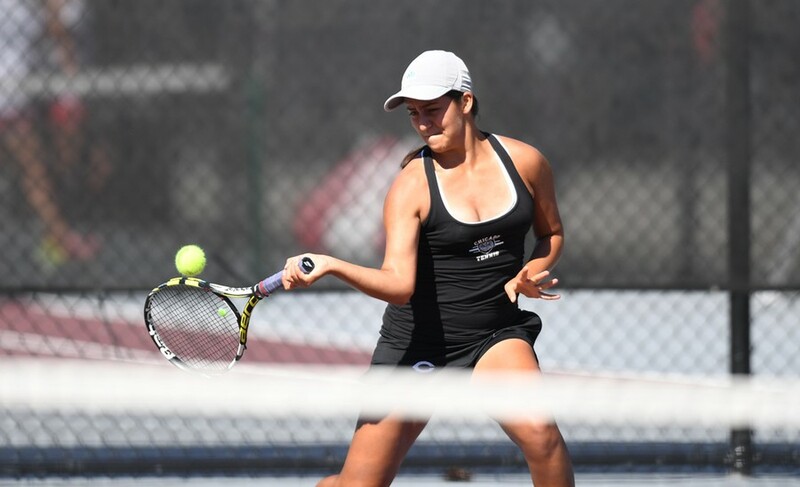 Classes started just last week, but the tennis season is already in full swing, and the women’s tennis team competed in the Intercollegiate Tennis Association (ITA) Central Region Championships this past weekend. The squad made its mark as usual, taking home second in both the singles and doubles divisions. The men had the weekend off after competing in the ITA Central Region Championships last week, winning both the singles and doubles championships. While the Maroons sent players to both the singles and doubles championships after a long weekend of tennis, the squad fell just short of completing a full Chicago sweep of the ITA Central Region Championships. First-year Marjorie Antohi competed in the singles championship after entering the tournament as the ninth seed. Even though the squad was unable to get the win, in a field of 128 players, four of the final eight players in singles were Maroons, which is an accomplishment in and of itself. To get to the championship, Antohi had to take down third-year Maroon and second seed Ariana Iranpour. Antohi would then face the top seed of the tournament, rival Wash U’s Rebecca Ho, falling 6–4, 6–3. That was the second meeting of the day between Antohi and Ho, however, as they had already faced off in the doubles championship. Antohi paired with fellow first-year Estefania Navarro for just the second time in their young college careers. Just as in the singles matchup, it was the ninth-seeded Maroons versus the competitors of Wash U who held the top seed. Out of the 64 doubles teams in the tournament, three different Chicago tandems made it all the way to the quarterfinals. Despite coming up short in both championship matches, the South Siders certainly made a statement this weekend with noteworthy success across the board, boding well for the upcoming season. Antohi is excited about the team's success, but acknowledges room for improvement. "We have a very talented team and a lot of depth in the lineup on both the men's and women's sides," the first-year said. "I think that a little more practice indoors and training in general leading up to the matches might have helped secure us the first place win [in doubles], but my opponents played well and deserved the win." The first-year is certainly making her mark on collegiate tennis. On her first month she said, "I've been enjoying college tennis a lot so far, largely because the team and our coaches have been so welcoming and fun to work with. Managing time with practice and tournaments has been challenging, but, because our fall season is so short, tournaments will not be a problem for the rest of the quarter." The Maroon women now have a long break until their matchup versus Kenyon College and Denison University at Greencastle, Indiana, on February 17. The men will compete in the ITA Oracle Cup in Surprise, Arizona, on October 13–16.